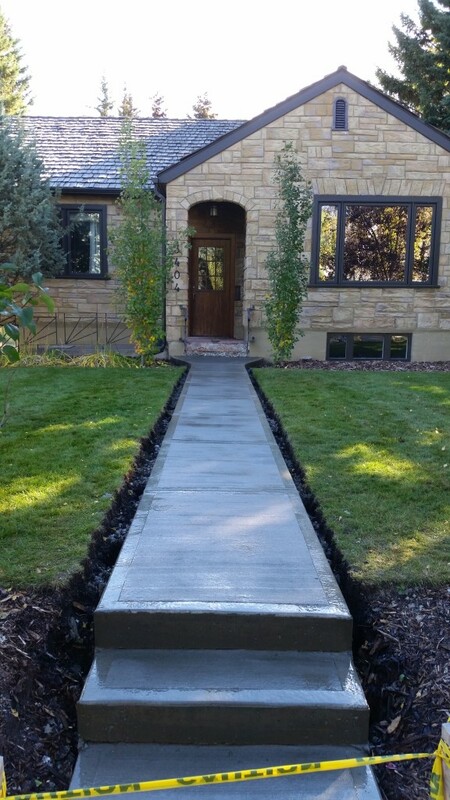 Goodstone Concrete provides a variety of concrete construction services to the greater Calgary area. 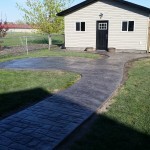 Our products include concrete driveways, patios, garage pads, flooring, sidewalks and more. 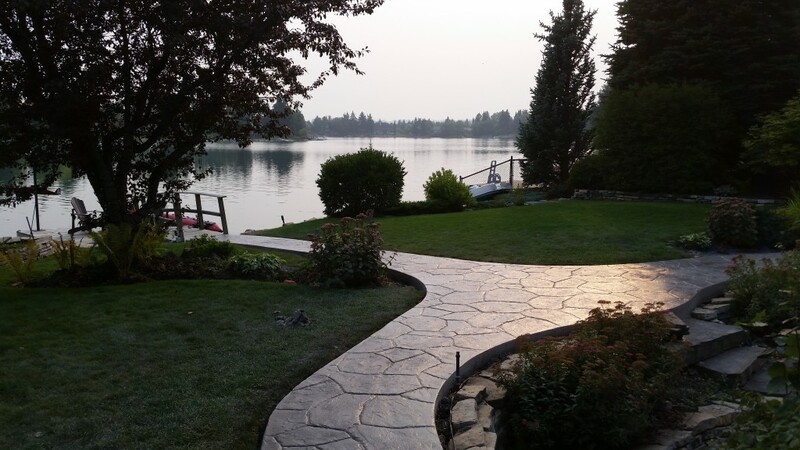 Whether your looking for decorative stamped concrete, exposed, or just a simple smooth finish, our highly skilled finishers are up to the task. With over fifteen years experience in both formwork and finishing, we've built just about everything. Our contractors are always available for a call, and are more than happy to help you design your project, as well as walk you through the construction process from start to finish. We believe in having not only a great product, but great customer service as well. Our projects are built to the highest of standards with no corners cut. We take pride in the things we build and it shows in the final results. If you're looking for a quality product that your friends and family will love, contact us today. 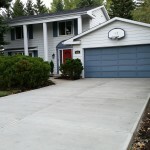 Concrete driveways are a great way to add to the look and value of your home. Stamped, exposed or cut and broom are just a few of the many specialty finishes to choose from. 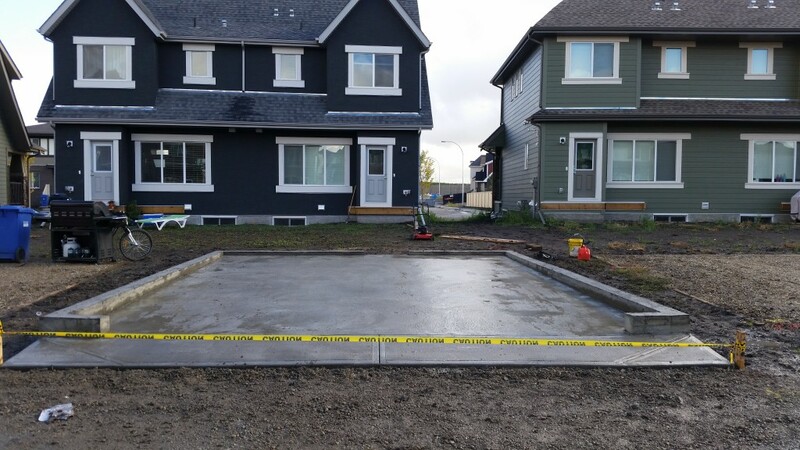 Our	driveways are poured at a consistent four inches thick and we use a high density concrete with plenty of relief cuts to prevent cracking. 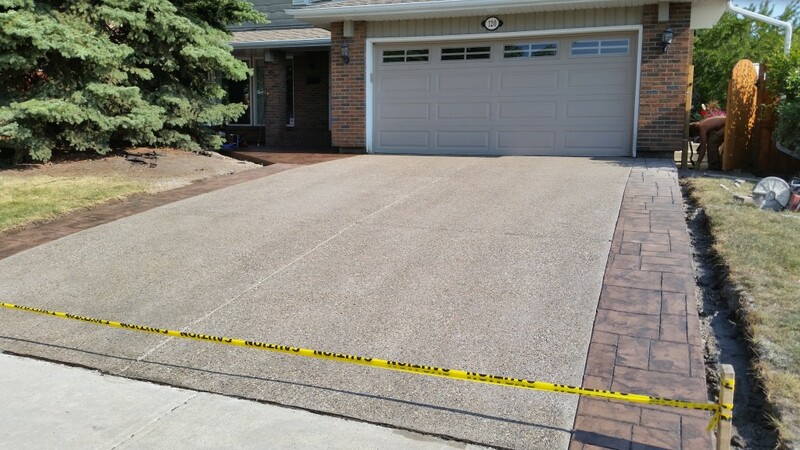 We use only top quality sealers to keep the driveway looking new for years to come. 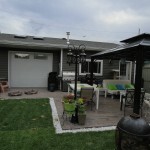 Concrete patios are the most diverse out of all the custom concrete projects. Our contractors have a wealth of knowledge and experience and can accommodate any size, shape and finish. 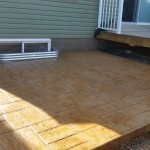 Stamped patios are the most common, but exposed or a combination of decorative finishes can be used for a great result. We love custom patio construction at Goodstone and we're and are happy to help you design and create whatever you need. 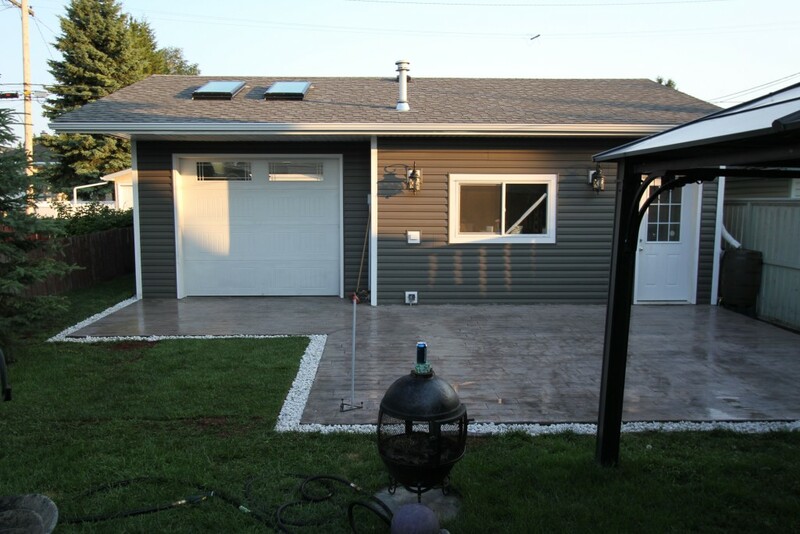 A concrete garage can add value and utility to your home. Smooth is the most common finish, but a stamped finish can also be used for a more decorative result. 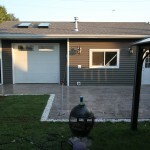 We offer both flat garage pads, and a pad with curb walls. 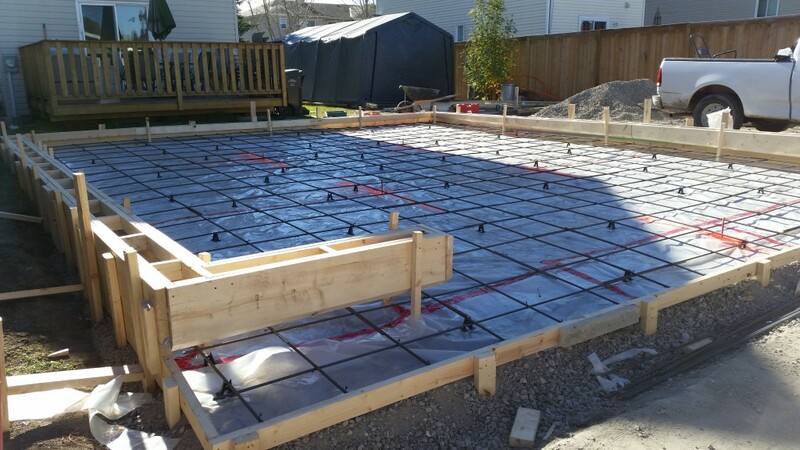 For strength and longevity our garage pads are poured to a minimum of 4 inches thick. Rather than pour footings, walls, and then slab, at Goodstone we pour everything at once in a monolithic slab which is a stronger and more cost effective option. 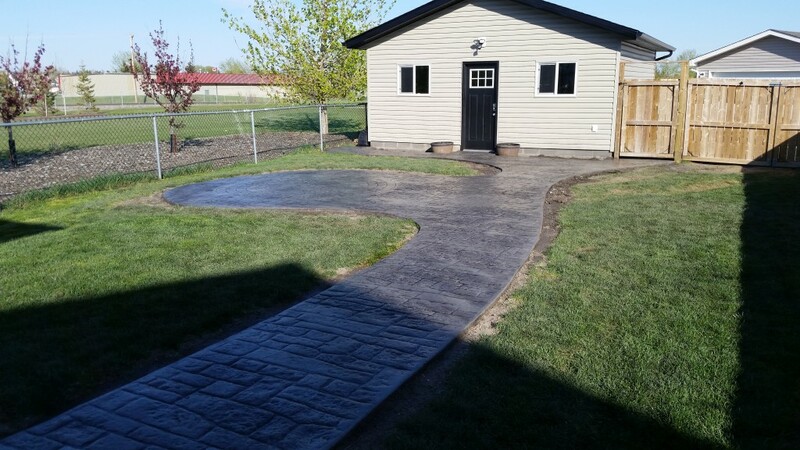 Concrete sidewalks can be put anywhere on your property, whether your looking for stamped, exposed, or another concrete finish, our contractors will work with you to meet your individual needs. 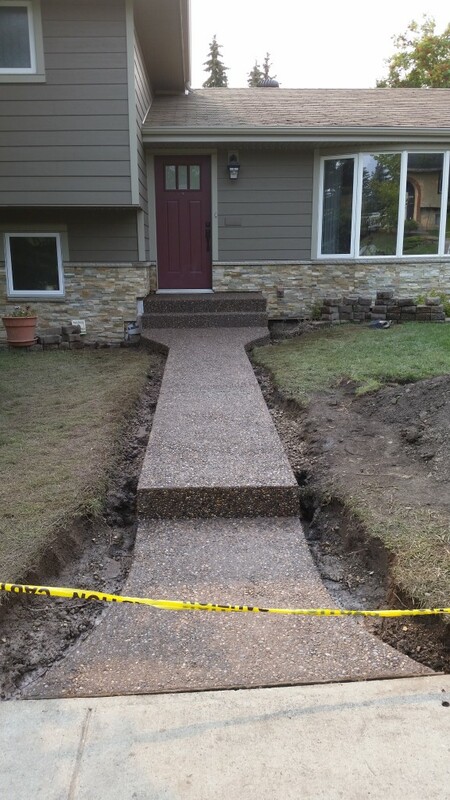 Our sidewalks can be connected to steps, driveways or the side of your residence. If your sidewalk is set against your foundation, underground metal brackets ensure your sidewalk will not shift over time. 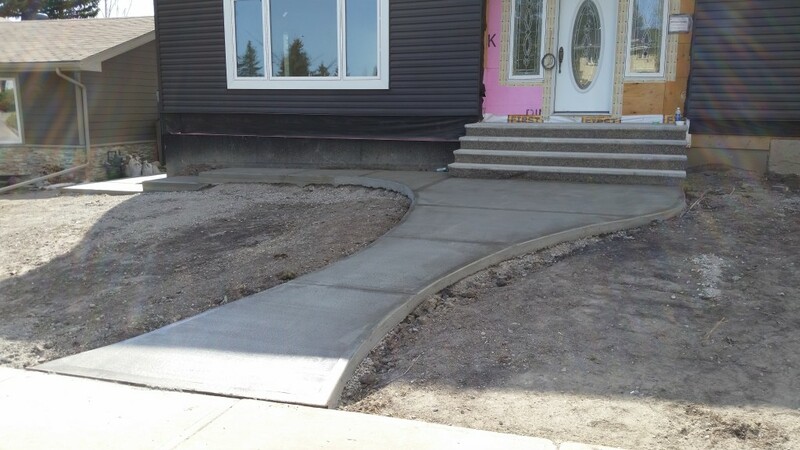 Our construction techniques ensure you sidewalk not only looks great, but stays looking that way. Heated Concrete flooring is a stylish and cost effective way to heat your home. Most commonly used in basements, a heated concrete floor will cost less than carpeting. Additionally, with the money you'll save on your heating bill, most heated floors eventually pay for themselves. A smooth finish is good for most utility rooms, and stamped concrete can be used to give your floor the color and style you're look looking for. Concrete formwork preparation is the foundation of any concrete project. Our years of contracting experience ensure the proper construction techniques are used everytime. At Goodstone no corners are cut, with the proper amount of rebar going into every job. 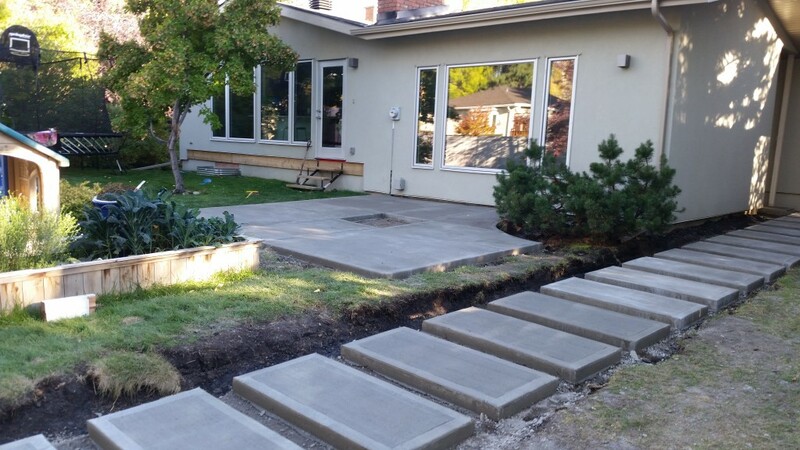 Concrete removal can be a challenging process, so let us handle the heavy lifting. 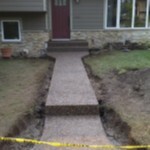 We remove concrete driveways, patios, sidewalks, steps and flooring. Of course we're happy to replace old concrete with something new, but we do just the removal as well. Reseal your concrete and make it look new again. A good sealer can protect your concrete from salt, staining and other wear and tear, as well as refresh it's appearance. Road salt is one of the major causes of chipping, also known as "spalling" in concrete. The salt dissolves, sinks into the unsealed pours of the concrete and then re-crystalizes. This creates upward pressure and causes the surface to break apart. 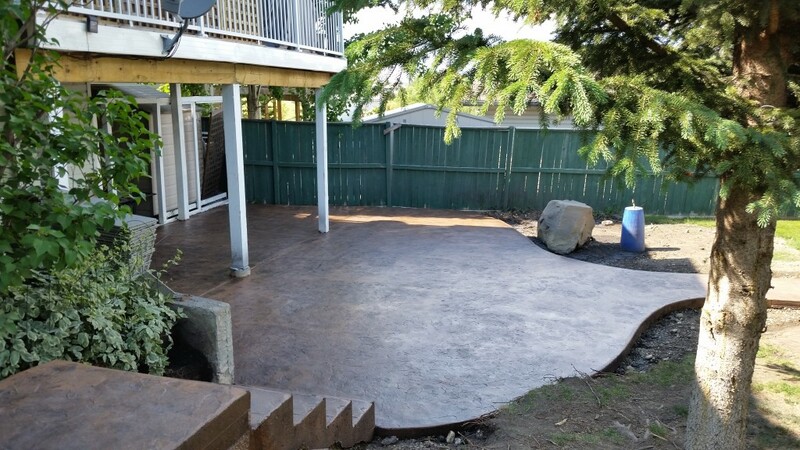 Once the concrete has spalled the repair or replacement cost can be relatively high. If you have decorative stamped, or exposed concrete, it's important to reseal every 2-3 years. We apply two coats with a light dusting of sand in between for extra traction. Give us a call for a free quote. 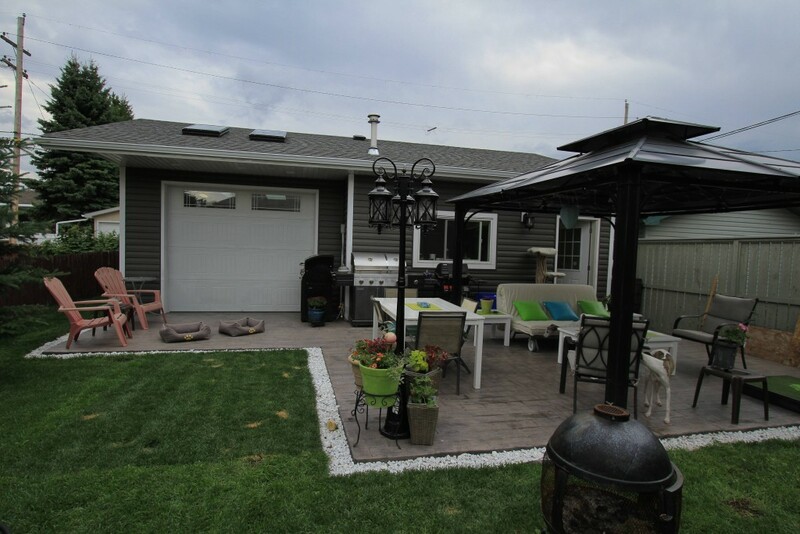 A properly installed hot tub pad will provide a solid base with good traction for your hot tub. 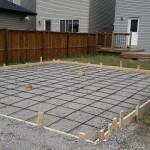 Our product includes a 5 inch thick slab, a gravel base beneath, and steel rebar inside the concrete. Installation is quick, and pricing is usually 2500-3000 depending on the size. 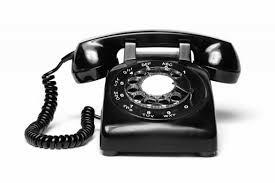 Give us a call for a free quote which can be done over the phone. 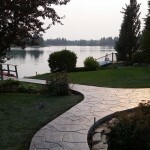 Stamped concrete is the most versatile decorative concrete solution. 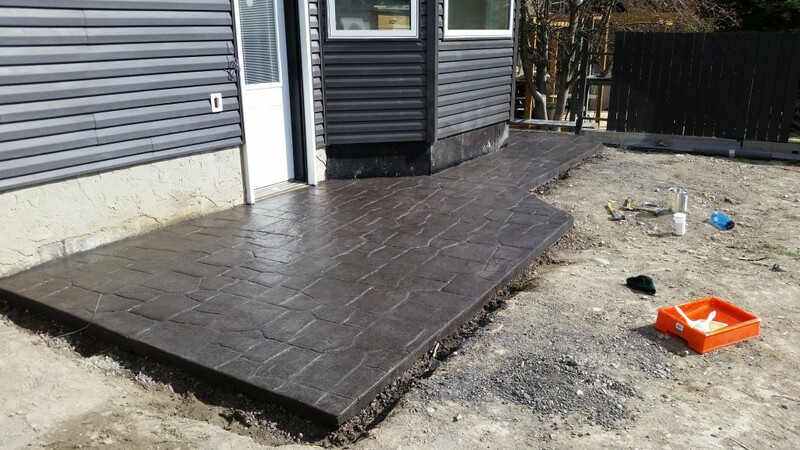 Perfect for driveways and patios, it uses high density mix that is poured into place, finished smooth and then stamped into a custom look. Cobblestone, slate, brick and wood are just a few of the endless possibilities. With many different colors and highlights to choose from, stamping your concrete can provide a beautiful one of a kind finish. At Goodstone we use only the highest quality stamps and sealer to keep it looking as colorful and mark free as the day it was finished. Exposed concrete contains small multi colored river stones. 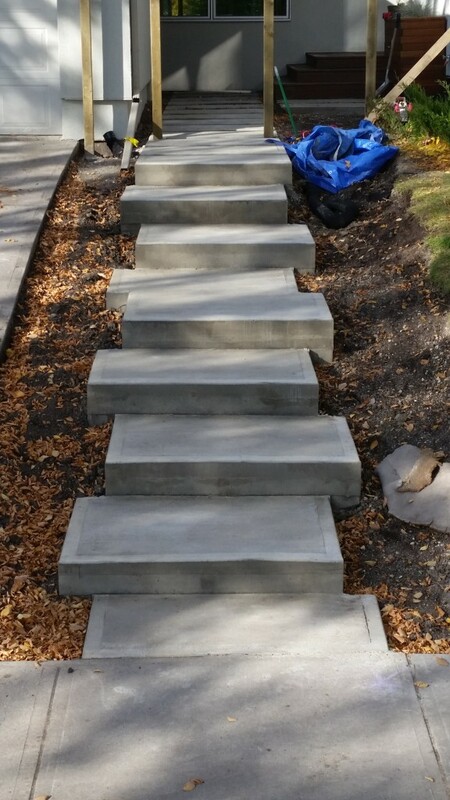 After the concrete is poured and finished, the surface is washed off leaving the stones exposed giving it a natural look. 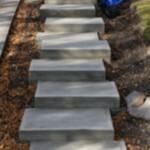 Perfect for stairs, driveways and vertical concrete, it can provide a seamless finish throughout the entire piece. Add a little color or put an exposed border on another finish for fantastic results. 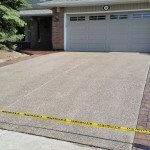 Cut and broom provides a square uniform concrete finish with ample traction that's perfect for driveways and sidewalks. Grooved wet cuts enhance the appearance as well and reduce the risk of cracking. Easy to clean and shovel, cut and broom is your best bet for longevity in high traffic areas. With a wide variety of integral colors and highlights to choose from, take this classic look and make it your own. 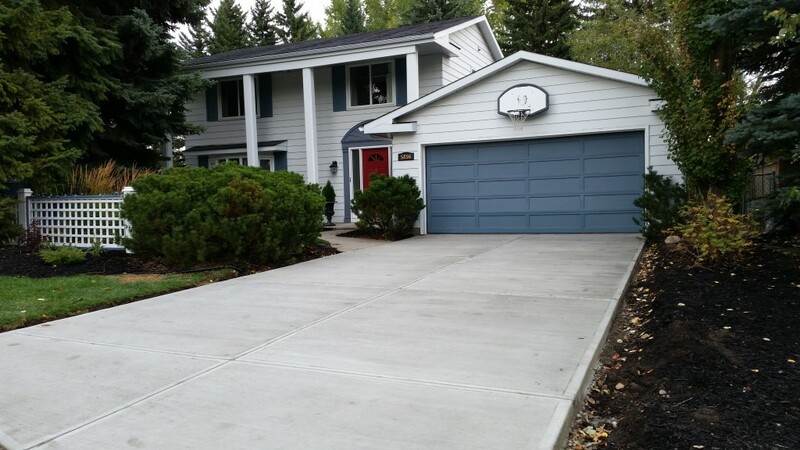 Smooth finish concrete is perfect for garage and basement flooring. The concrete is poured into place and then troweled for an extended period of time until it's is as smooth as possible. At Goodstone all our products are hand finished, providing a much smoother and stronger surface than a machine will. A friendly and professional estimate can be the first step to making your vision a reality. Request an estimate by filling out the form below and we will contact you. Rough Quote - I'm just looking for a ball park number over the phone to see if this project fits my budget. Measurements - Please describe the measurements of the concrete slab you would like a rough quote on. Accurate Estimate - I would like to meet for an accurate on site estimate to select the right company for the job. Availability - Please describe your availability to meet during the day on Thursday and Friday and we will contact you to set up a time that works for you. At Goodstone we're always happy to hear from a potential customer. 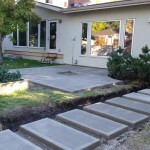 If you considering a concrete project feel free to give us a call to discuss your options. Our contractors are happy to answer any and all questions. We can help you find the product, design and style that's right for you. This section will provide an overview of what to expect when hiring Goodstone Concrete to complete your project. Your contractor will go over all of this with you as your the project moves forward. The best way to get an estimate is to fill out the Estimate form on the Contact Us page. This gives us the information we need to get you a rough quote over the phone, or line up a meeting with you for an accurate on site estimate. If you aren't sure what your project might cost, or whether you want go ahead with it, a rough estimate is a good way to start. Our staff will call you to discuss your options and get you a ball park number over the phone. If you are fairly certain you want to go ahead with your project, select the Accurate Estimate option and we will contact you to set up an on site meeting. Your contractor will meet you at the location of your project. 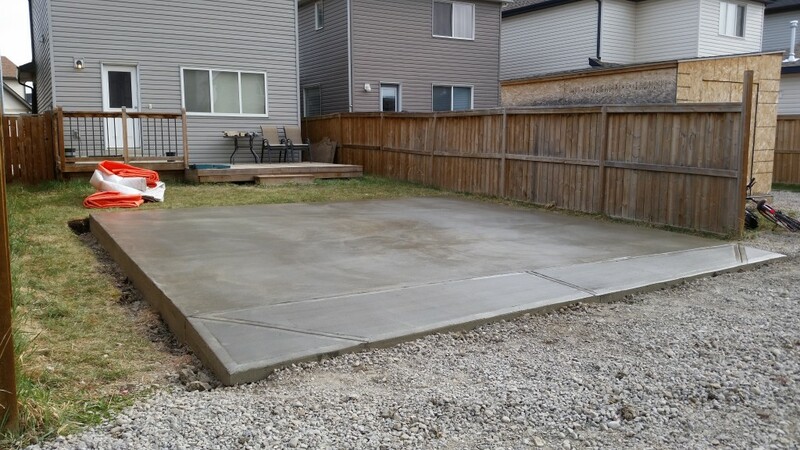 After talking with you about your needs, we'll take measurements and make a detailed drawing of the new concrete and the surrounding structures. We'll also walk you through the construction process, and talk about a few of the measures we take to ensure a high quality job. Once the estimate is complete, you can expect an email within a few business days containing your quote, as well as a breakdown of the costs. This quote is the number that will appear on your final bill regardless of any difficulties we may encounter. We've never made excuses to ask for more money and we never will. 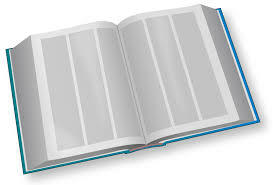 Once you confirm that you would like to go ahead, we put your job into the books and your place in line is reserved. There's no down payments or material deposits, so there's no need to worry about that. We don't collect payment until the work is done. Based on the amount of work we have, we'll be able to give you a rough idea of when we're coming, and then contact you a few days ahead of time before we show up. We like to under-promise and over-deliver so there's always the chance we can get it done a little sooner than mentioned. On some projects, existing concrete needs to broken up and removed before new concrete can be built. A bobcat with a breaker attachment will fracture your concrete and then load it into a dump truck. Handheld jackhammers are used in tight areas and close to existing structures so that the vibrations from the breaker do not cause damage to anything else. 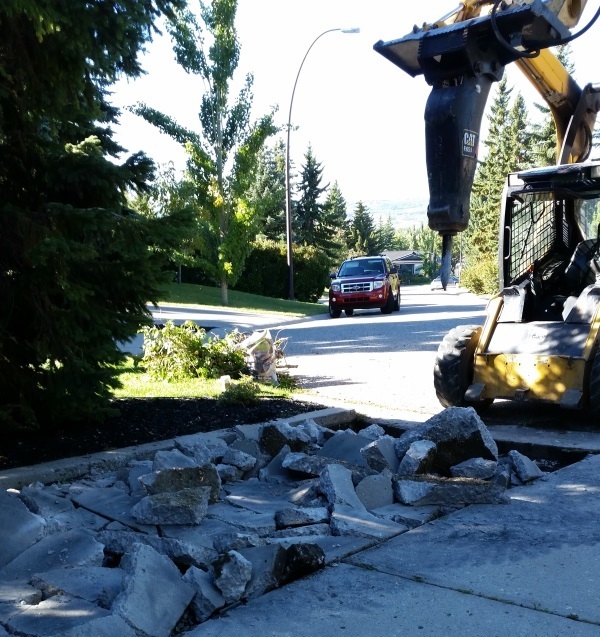 Once the concrete is loaded, it's taken to Calgary Aggregate to be recycled and reused as gravel. 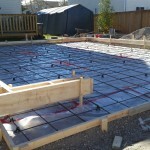 Formwork is the process of preparing the site for concrete to be poured. First, the ground is excavated. The utilities are marked, and the ground is dug by hand, or by a bobcat, depending on the size and location of your project. The dirt is loaded into trucks and hauled off site. Once excavation is complete, wooden forms are built to house the wet concrete. The wood is measured, cut and securely fastened into the ground to make sure it does not bulge under the weight of the concrete. When the forming is done, a thick layer of gravel is placed and compacted inside the forms. 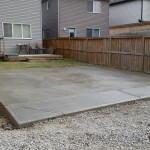 Having a gravel base allows water to drain away from the concrete, as well as giving space for the ground thaw to expand in and out of without heaving the slab. On a typical job the ground is excavated 8 inches, 4 for gravel and 4 for the concrete. 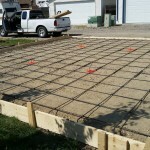 A grid of rebar with 18 inch centers is then placed inside the forms, and tied together. Concrete has a very high compressive strength, but a lower tensile strength, which means it pulls apart a little more easily. 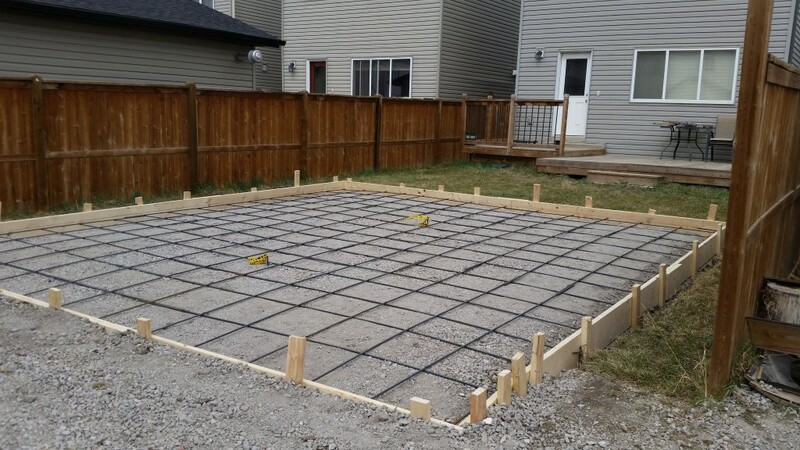 Having rebar greatly increases the tensile strength of your slab, which helps prevent cracking. 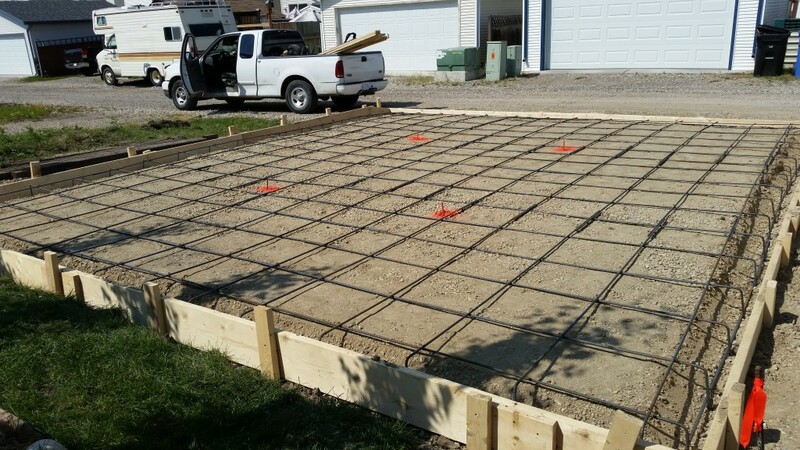 The rebar is attached to any adjacent concrete, ensuring that your slab does not shift over time. If the concrete is being pumped, chairs are added to lift the grid off the ground and ensure it ends up in the middle of your concrete and not at the bottom. Usually this entire process takes 1-2 days, but can take longer for larger jobs. Once the formwork is complete, it is ready to pour. Usually concrete can be scheduled within one week of finishing the formwork. Rain, hail and freezing overnight temperatures can all severely damage concrete while it is still wet, so it's wise to be patient and wait for a good clear day. The concrete is ready mixed off site by Burnco Ready Mix and delivered wet. We use a minimum of 32 MPa concrete in all our products, which means that the concrete is built to withstand heavy weights and large amounts of pressure. If there is good access, the concrete can be placed using the chute on the truck and a wheelbarrel, otherwise a line pump is neccessary to get the concrete into place. The concrete is raked, leveled, floated, edged and wiped until smooth. For a brushed, or "cut and broom" finish, evenly spaced relief cuts are added about every 10 feet, and a broom is brushed across the surface. The relief cuts help reduce the appearance of cracking and the brushing provides traction in a aesthetically pleasing way. 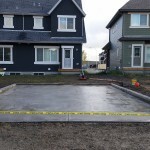 Once the pour is complete you will be able to walk on your concrete 2 days later, put your patio furniture on it after one week, and park your car on it after 3 weeks. After 28 days your concrete will have fully hardened. If you chose a smooth finish or cut and broom, then cure and seal is sprayed on the surface of the concrete on the day of the pour. 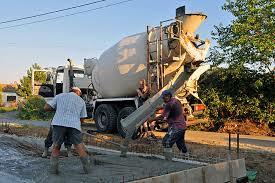 Although concrete is solid enough to walk on after a day or two, it takes 28 days to fully harden. It's important that the concrete stays wet on the inside during this time. The water allows the concrete molecules to continue forming bonds with each other in a process called hydration, which makes for a harder, stronger concrete slab. Applying cure and seal prevents the water from evaporating too quickly, and results in better, longer lasting concrete. Once the cure and seal is on, we will come back a few days later, remove the wooden formwork and you are finished! If you chose an exposed aggregate finish, then concrete retarder is sprayed on the wooden formwork and the surface of your concrete on the day of the pour. This prevents the very top layer of concrete cream from hardening. Once the inner concrete has hardened we wash away the top layer of concrete cream. With the cream gone, you will be able to see the river rocks contained in the exposed concrete mix. We will return the next day to remove the wooden forms. 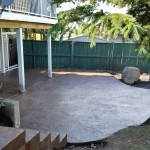 The concrete is then sealed using a high quality sealer and you are finished! If you chose a stamped finish then an integral color of your choosing is added to the concrete mix on the day of the pour. This gives you the base color of your concrete. 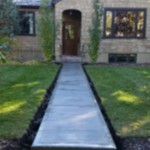 Once the concrete is smooth, a release color of your choosing is spread across the surface and stamped into the slab. This gives you the color of your highlights and textures. A few days later the wooden forms are removed and the excess release powder is washed away. For a multi-colored highlight and an even nicer looking finish ask us about ECO-Accent concrete wash. Lastly, the concrete is sealed using high quality sealer and you are finished! 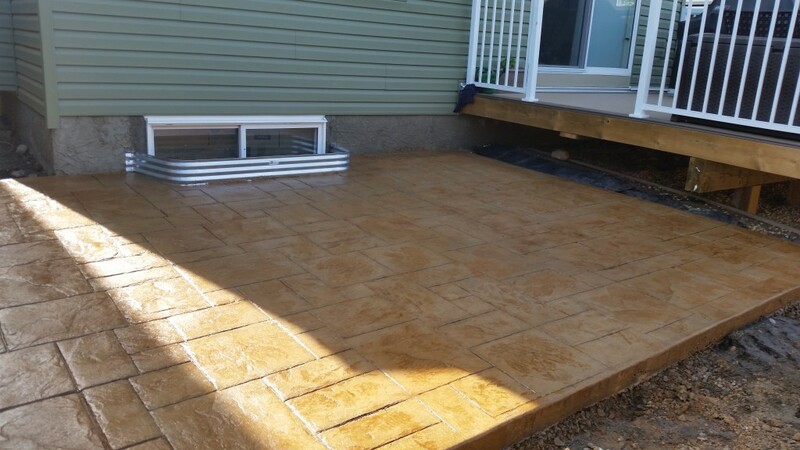 Freehold Construction - A provider of decorative stamped concrete products to calgary for over 10 years. Freehold construction has thier own team of quality prep and finishers, we're happy to work with them on our very large jobs to ensure the project is completed in a timely manner. 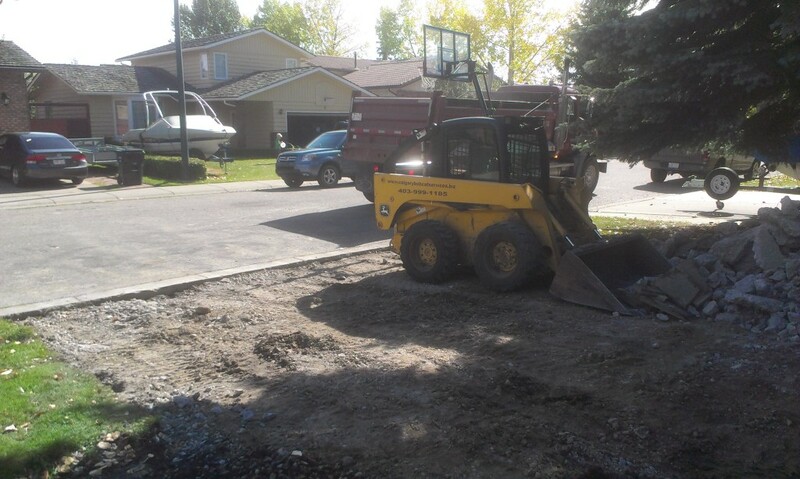 Grave Earth Works - A high end landscaping and construction company serving the greater Calgary area. 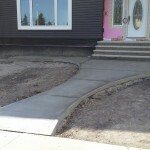 Often times our customers are looking not just for a concrete project but to landscape thier entire yard as well. We're glad we can recommend someone they can trust to do the job right. DSO Coatings - A provider of high quaility concrete sealing and sandblasting services. 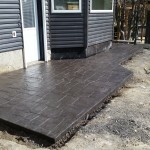 They custom mix each batch of sealer and the end product is a cut above anything else you will find in Calgary. Goodstone is proud to partner with them for our sandblasting and sealing needs. 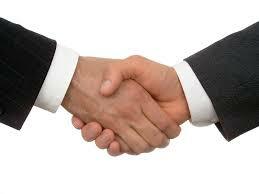 Having great partners to work with gives us the flexibility to handle any size job.